Around 1.5 million people turned up near Burj Khalifa in Dubai to watch the New Year's Eve show. This year’s festivities were a bit different, with Emaar replacing the fireworks with a light show. As the clock chimed 12, Burj Khalifa came alive with the most spectacular laser show that triggered a collective gasp from thousands. It also established a new Guinness World record for the largest laser light and sound show on one single structure. The world's tallest tower was bathed in dazzling laser lights in a dynamic dance synchronized with music. 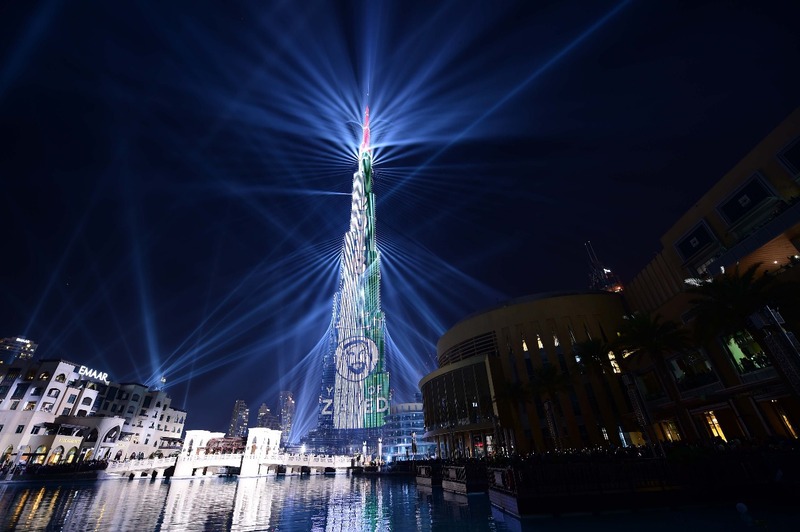 The 10-minute laser show began with a display of 2018 being Year of Zayed and went on to display the symbols of the nation - The UAE flag, the falcon in flight and the Arabic language - all to fanfare and razzmatazz. The clean up crew has arrived! The clean up crew get's to work while people continue to celebrate outside Burj Park, Dubai. People are the only thing moving on Shaikh Zayed Road, at ad hoc crossing point near Dubai Mall metro footbridge. RTA is in coordination with Dubai Police and will be managing the traffic movement on Sheikh Zayed Road to allow for the pedestrians to cross to the area opposite Burj Khalifa. Designated areas have been assigned near Burj Khalifa and Business Bay Metro Stations in addition to a third crossing below Dubai Water Canal Bridge. To ease your exit from Burj Khalifa area after the end of celebrations, RTA Dubai provided 55 buses on Financial Centre Road, to transport passengers to Jafiliya & Deira City Centre Metro station and the designated parking areas at Al Eid Musala in Mankhool Area and Al Wasl Club. RTA also provided 90 buses on Sheikh Zayed Road direction Dubai, to transport the passengers to Jaflya and Deira City Centre Metro station and the designated parking areas at Al Eid Musala in Mankhool and Al Wasl Club. 110 buses ready in Downtown to carry people back to different Parking areas. Other busses are heading to Al Wasl Club, Al Jafliya, Al Mankhoul, and Dubai Water Canal. If you want to read about fireworks, check out our live coverage of the rest of the UAE here. Shaikh Hamdan Bin Mohammad Bin Rashid Al Maktoum, Crown Prince of Dubai sends out a special tweet wishing everyone a happy New Year by reciting an Arabic poem. "One of the most beautiful years is gone...Bye bye my beautiful memories" he says. Crowds sing along to popular songs as they wait for the Burj countdown. The countdown is every 15 minutes on the Burj Khalifa. The lively atmosphere continues around the Burj Khalifa. One reader shows us the view from the top. Three hours to go! The countdown begins on the Burj Khalifa. Dubai Mall diners are enjoying their unobstructed view of the Burj Khalifa spectacle. Thousands of restaurant and mall staff are working round the clock. Despite the big party buzz it's business as usual downtown. Resident Nader Smair is watching the epic show from an appartment in Downtown Dubai. This is the view from the top. People have brought along mats and pillows to camp out opposite the Burj Khalifa ahead of midnight festivities. Refreshment stalls have been set up at various spots in Downtown Dubai for Nee Year’s Eve celebrations. Crowd near Burj Plaza has now overflowed onto Mohammad Bin Rashid Boulevard. As the streets are closed to cars, people are walking freely on some sections of the boulevard. Some visitors trying to get through alleys for closer look at Burj Khalifa - but getting turned away by security. Police officers on bicycles at the Burj Park! Everything is ready and set in place for Burj Khalifa to break the Guinness World Records with a spectacular laser show. It's cold and roads are blocked. Check out the side view of the Burj Khlifa. It's wearing it's regular look, so make sure you get a front view. Traffic on Shaikh Zayed Road is very heavy. Motorists urged to park at alternative parking areas and catch a free bus to Downtown Dubai. 170 buses shuttling revellers to and from Downtown. A large screen has been set up for people to watch the light show. Lights on! The Burj Khalifa New Year's Eve celebrations have begun. Roads closed: Shaikh Zayed Road from Dubai World Trace Centre roundabout towards Dubai Mall, Mohammad Bin Rashid Boulevard and Financial Centre Road. Police advise public to use the Dubai Metro to arrive to the event area. Dubai Police is at your service at every corner in Downtown Dubai! As part of their New Year's Eve 2018 plans, the Dubai Corporation For Ambulance Services put 190 different types of specialist ambulance on standby in vital areas, including internal and external roads. Traffic update: If you're heading out for New Year's Eve celebrations in Dubai, here's what you need to know. A drone has been spotted in the sky above Downtown Dubai. Say Hello to the Dubai Fountain at 5pm on the dot. Dubai Corporation for Ambulance has many mobile paramedics on bikes moving around with life saving equipment to reach people onsite weaving through the crowds. According to Dubai Police, the Dubai Mall parking is 90 per cent occupied, with very little parking spots left. People have grabbed vantage points around the fountain over seven hours in advance. Dubai Police: Al Asayel Road from Oud Metha Street towards Shaikh Mohammad Bin Rashid Boulevard is now closed. 8 hours to go until midnight and the crowd is flooding Downtown Dubai. It seems that everyone is ready for 2018! The crowd heading to the outdoor area. Find out about the road closures in the Downtown Dubai area. Dubai Police have been stationed around the Burj Khalifa metro station. Crowds heading to Burj Khalifa site on Dubai Mall station. The big rush has begun. Amit and Sarita Dangi are a couple from New Delhi, India here with their son Avil specially here to watch the New Year celebrations. Visitors to Downtown Dubai can watch the spectacle from various vantage points. 1. Al Khail Road: Head to the Sharjah-bound side and you can get a great view of the lights show from Mohammad Bin Rashid Al Maktoum City, Meydan Interchange and Business Bay Interchange. 2. Special viewing decks: Decks have been installed at Burj Park and at some spots in Mohammad Bin Rashid Boulevard. 3. Watch at home: The event will be broadcast live on televisions as well as on Burj Khalifa’s social media accounts and on big screens in Downtown Dubai. 4. Taj Dubai: Head to the rooftop at Taj Dubai in Business Bay if you have booked a table or a staycation for the night. But the best places to watch the show comfortably, would be on one of these burj view tables.